Marmon is one of the great pre-war American automobile marques. Their association with the Indianapolis 500 alone makes them legendary, having won the inaugural race. The company was actually based in Indianapolis as well. The Model 34 was introduced in 1916 – amidst the looming backdrop of world war. The model would last through 1923 – making the Speedster you see here from the last year of manufacture. The car uses a 34 horsepower 5.5-liter straight-six. The body was modeled after the Barney Oldfield-driven 1920 Indy 500 pace car. A Model 34 was also driven coast-to-coast by Erwin “Cannonball” Baker as a publicity stunt. 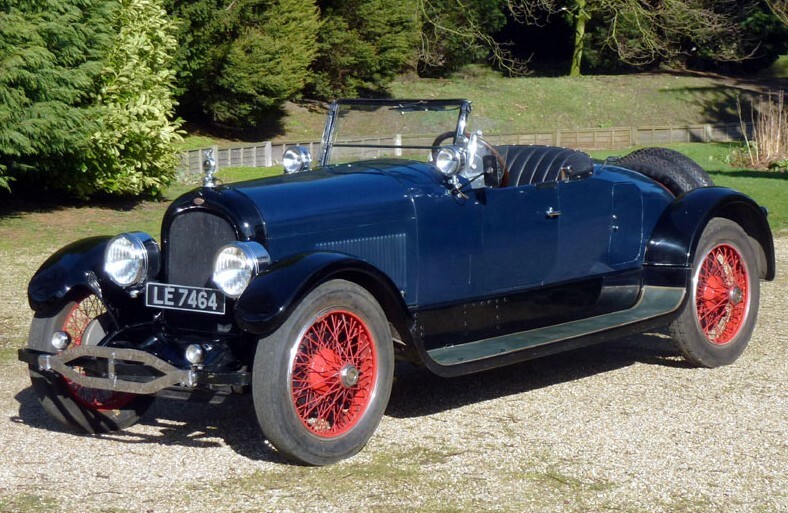 This car presents well as an older restoration and was used in two different British television series. It actually looks like something that would be fun to drive – not to mention it would surprise people that it is something as rare as a Marmon. It should sell for between $46,500-$58,000. Click here for more info and here for more from H&H Auctions. This entry was posted in Uncategorized and tagged 1923, auctions, cars, classic cars, h&h auctions, marmon, model 34b, speedster by classiccarweekly. Bookmark the permalink.